Voxengo Voxformer for Mac is a multi-functional vocal channel strip plug-in for professional audio applications(Virtual DJ, FL Studio, SoundForge, Cubase, etc). Combining several professional quality processing modules, Voxengo Voxformer for Mac was designed to be a comprehensive solution for all your vocal processing needs - be it spoken or sung vocals. 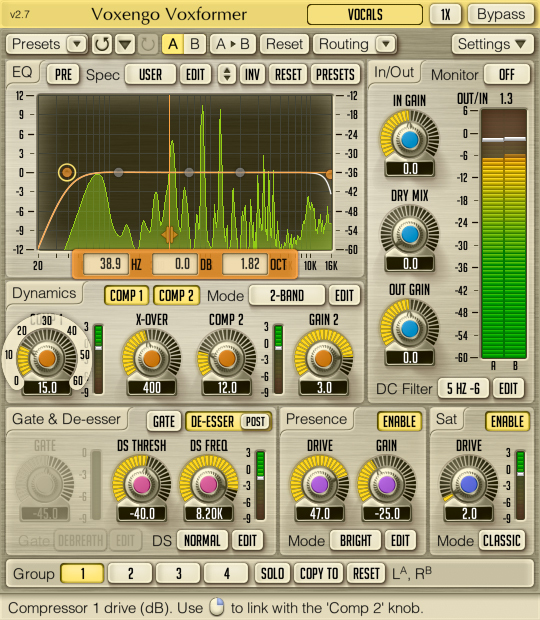 The coolest feature of Voxengo Voxformer for Mac is its one-knob vocal compressor. ...... Using only a single knob, you can get a tight, open and definitive professional vocal sound with an excellent articulation in no time. You do not have to worry about common ratio and make-up gain controls since they are automatically selected by the advanced compression algorithm while attack and release parameters are stored in a mode preset. Moreover, Voxengo Voxformer for Mac features two compressors of this type, allowing you to apply either a two-band or a two-stage (serial) vocal compression. Qweas is providing links to Voxengo Voxformer for Mac 2.7 as a courtesy, and makes no representations regarding Voxengo Voxformer for Mac or any other applications or any information related thereto. Any questions, complaints or claims regarding this application Voxengo Voxformer for Mac 2.7 must be directed to the appropriate software vendor. You may click the publisher link of Voxengo Voxformer for Mac on the top of this page to get more details about the vendor.